Well, it's here at last. My farewell post to this blog. But the good news is that I am moving to my new blog on my new-look website - still katefurnivall.com - which goes live on Thursday 16 February. So I do hope you'll join me there. I want to thank all of you for hanging out with me here. I've enjoyed all your comments and your support has meant a lot to me. It's good to know you're out there! My new book THE WHITE PEARL is published on 16 Feb 2012, so head on over to my new website on Thursday to read more about it. There will be loads of extra info and interviews, as well as a fun competition to win a copy of the book. In addition, a whole new world will be opening up to me with my new Facebook Fanpage which also gets going on 16 Feb - so check it out. Looking forward to seeing you there. Happy reading! Happy New Year. Come on, let's make 2012 a good one, despite all the doom and gloom spilling like black treacle out of the media. 1. Endeavour (yet again) to eat less chocolate, to take myself off to the gym with greater alacrity and to clip my cat's claws more often before she turns my stair-carpet into shagpile. 2. Regard my computer as my friend, rather than my taskmaster. 3. Get scenes down on paper immediately, instead of concocting them in great detail in my head and then finding that they have drifted away while I trotted off in search of that essential cup of coffee or just made a quick phonecall. 4. Make lists. And lists of lists, if necessary. That way my desk might stay tidy. 5. View each difficulty that trundles across my path as a challenge that will stretch me, make me stronger and give me a chance to open new doors. 6. Meet my publisher's deadline. 7. Meet my publisher's deadline. 8. Meet my publisher's blasted deadline. 9. Lunch less. Quaffing merlot with author-pals does not count as research. 10. Writing is huge fun. Remember to enjoy it. ps. Nothing I do will persuade this blog font to match previous entries, sorry about that. I have wrestled it to the ground and still lost. I suspect it has something to do with the fact that preparations are in place for my new all-singing website and this one is sulking! Today is special. The export edition of The White Pearl is published in countries worldwide, so I shall soon hear initial reactions and reviews. Always a nervy time. But I was thrilled to hear that in Australia they are doing an interesting offer:- Buy a copy of The White Pearl from any Whitcoulls store and enter a draw to win a Pearl Set from Pascoes Jewellers. Now that's what I call a promotion worth having! I'm just back from a research trip to Egypt. It was an amazing experience. However many times I had studied pictures of it in books or on TV, nothing prepared me for the impact of stepping into my first ancient Egyptian tomb of a Pharaoh. It is utterly breathtaking. The artistry, the exquisite beauty of the carvings, the mystery and the sense of timelessness are overwhelming. 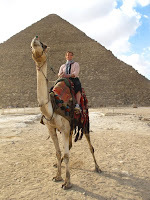 Because of the political turmoil in the country at the moment, there are barely any tourists there, so I was privileged to see the great sights of Egypt without jostling crowds or impatient queues in the hot sun. Hatshepsut's temple, Tutankhamun's tomb, Saqqara and Karnak, the glorious antiquities inside the Cairo and Luxor museums, all lie quietly undisturbed by chatter or clicking cameras. But what turned out to be good fortune for me is of course causing Egypt's economic downfall, as they badly need tourists to return with their dollars and euros. The Egyptian people are warm and welcoming, and I experienced no difficulties of any kind, despite being in Cairo during the protests in Tahrir Square. And I ended the trip with a real highlight - a hot-air balloon flight at dawn over the desert and its treasures. Now I can write my new book with the amazing inspiration and energy I drew from those ancient tombs. The summer months flew by in a blur of broken knee, followed by trips to Italy (stunning scenery) and Germany (wonderful wedding), but now I am deep into research for another book - which I am loving. An inside peek for you - it will be set in Egypt. But that's for the future. 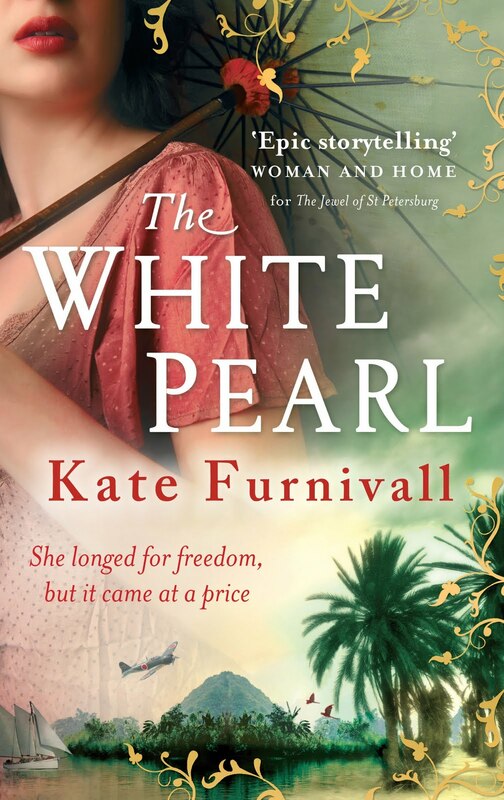 The big news at the moment is that my next book, THE WHITE PEARL, will be published in December in large format, and in usual paperback size in February 2012 in the UK and in March 2012 in the US. I am thrilled with the cover which says it all - the sweltering heat of Malaya, a young woman caught up in the danger of enemy airplanes and the passion of a love affair that changes the course of her life forever. To explore Malaya (yes, I know it's Malaysia now but in 1941 when the book is set, it was called Malaya) was an exciting change after my last three books in Russia. I loved the challenge of learning to understand somewhere completely new to me, a different culture, a different world. I chose Malaya and I chose 1941 because it was a time when this astonishingly beautiful country was poised on the brink of catastrophe and when internal conflicts were preparing to tear the country apart as it tried to throw off the heavy yoke of colonialism. Enough, enough! I won't tell more. Don't want to let spoilers slip out. This is always a difficult time for an author. The new book hangs in limbo, the writing finished, copyediting done, cover and blurb decided on by the publisher - just waiting for launch day. It's a nervy time. Early pre-publication copies have gone out to reviewers. Which magazines and newspapers will pick it up for review or even an article? And my head is still half in Malaya with Connie, but at the same time I am rummaging around with Howard Carter in Tutankhamun's tomb for the next book. I try to be patient but I am itching to see THE WHITE PEARL on the bookshelves. Not long now.